Ideal for bar, club, restaurant and retail lighting, the MiniMe is an effects lighting luminaire with the addition of full video output. 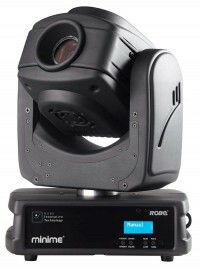 This small, neat, fast moving fixture is LED driven with a 20,000hour lifetime lightsource. Colours, gobos and beam shapes are all digitally generated by the on-board micro media server. Custom artwork, still photographs and video can also be simply uploaded for projection, whilst live video can be streamed through the HDMI input. The MiniMe won an Innovation Award at the recent PLASA London show at Excel.